Rosettes and Patty Shells are words that, when spoken a few years ago, I would have had to store in my memory and return home to "google". I did not grow up with such fancy and delicate desserts in my home. Don't think ill of me for pointing out the obvious, but it's true. I grew up on fudge, cakes and dense cookies. Nothing to balk at, yet, not the same as say a bratzeli, a rosette or a patty shell. 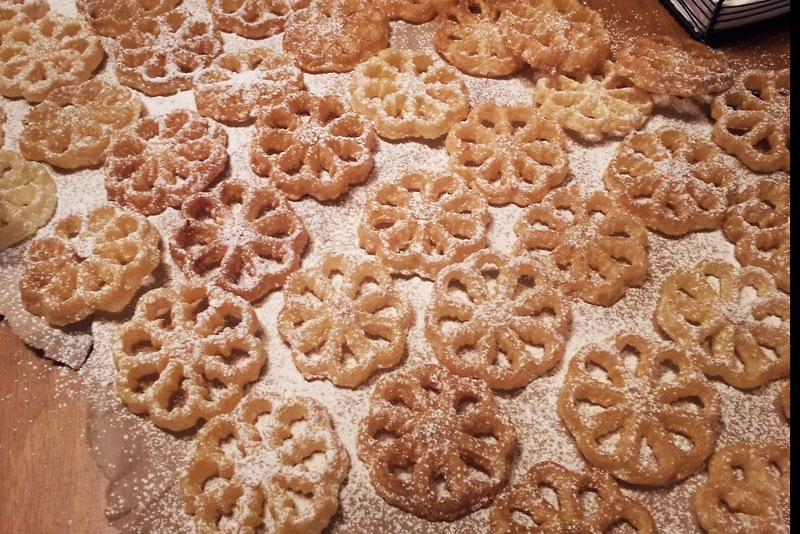 In December, That Skinny Chick Can Bake by Liz, shared her recipe for rosette's. I was mesmerized by these frail and lacy cookies. What were they and could they be made gluten free? Two common questions in my quest to find fun and challenging items to prepare and bake in my little white kitchen. The cyber world is full of explanation as to what and how these cookies are made, served and traditionally celebrated. I turned to Wikipedia and to discover the story behind this simple cookie. It took me roughly 5 minutes to read Liz's post and have my Rosette and Timbale set ordered and on its way to my doorstep. Timbale is another name for Patty Shell. I was so excited to have something so unique in my own kitchen. I know that these are a tradition in some cultures for Christmas but I saw them as a fun way to celebrate birthdays, Valentines and Mother's day. All three holidays, of which, I have on my horizon, as all three of my kids were born in January and February, and May is right around the corner. I soon discovered that my eldest daughter, Rye, was a sneaker of rosettes. I call her this because she is a very healthy eater and to have something before her that is so tempting as a fried cookie was beyond her self control. Each time I turned around I noticed that my pile of freshly made rosettes was diminishing, one cookie at a time. I knew immediately who the culprit was, there is no denying the white fluffy powder of confectioner's sugar on her chin. She grinned when confronted and we laughed that this cookie was too good for her to resist. 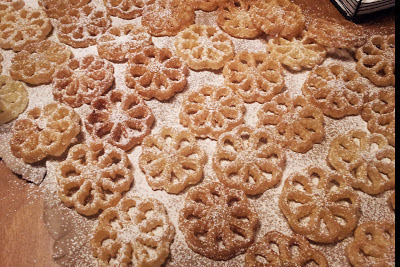 I dare say, rosettes and timbales are hit among my family and friends. I experimented with two batches, a gluten free version and the recipe that I found on Liz's site. I needed my family to experience the "real" version before I attempted a gluten free cookie so we could match the texture and flavors. I am happy to report that they are very similar, and to my delight, they disappeared just as quickly as the original batch had on those first few days of making them. Yes, you read that right, days. I made these three days in a row when I received my set in the mail--how could I not? The rosettes were fun to create, the family enjoyed them and I loved using all of my cast iron molds. I don't collect many things, but the cast iron molds are abundant in size and shape. I hope to add a snowflake to my box of goodies in time for Christmas 2013. Sunday Supper is a wonderful group of bloggers that has been organized by Isabel of Family Foodie. You can read her story here and learn about how it was started and why by visiting this link HERE. You can also follow along every Sunday on twitter with the handle, #SundaySupper. I was thrilled to be invited to participate towards the end of last year and decided to start in January. This is my first post. My first experience of a Sunday Supper with a talented group of friends. At the end of this bit of writing you will find the links to all of the participants and the recipes that they are sharing. This week is special because we are celebrating Sunday Supper's birthday. One year ago the idea of a seed grew into a sprouting and vivid garden filled with the choicest of recipes and friends. We have been asked to choose a past recipe from the 52 weeks of Sunday Supper for 2012 and share our version. As mentioned above, this decision was an easy one for me because Liz's recipe for rosette's was a great inspiration in my journey of cooking simple and yet gourmet recipes. I decided to make the timbale/patty shells and share my gluten free version of the recipe used for the batter. The cookie is delicate and holds its shape well. There is a fine line between frying them though-- too little and they become chewy and too long and they become dark and brittle. My suggestion is to have a thermometer to monitor the temperature of the oil. It should hold steady around 350 degrees. This may require that you turn the heat up or down on your stove top to maintain the desired frying temperature. In my attempt at creating something new and beautiful, I followed the picture on the box of my molds--the cups are filled with fruit. I added a bit of custard to the bottom of my patty shells but this is something that should not sit or they become soggy. 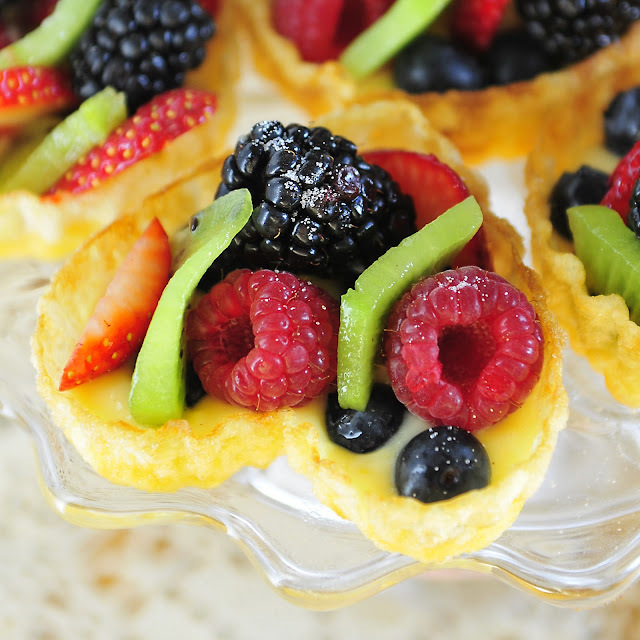 The fruit filled cups with custard would need to be made just before serving and then served with a plate…they are messy after the first bite. 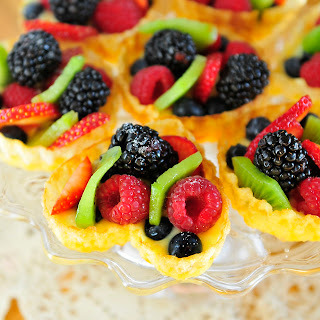 I would suggest a fruit bar with the shells on a plate, the fruits diced and ready to serve. Have the option of a filling (pudding or yogurt) available and let your family and guest create their own works of beauty. The patty shells are just as delicious on their own with a bit of confectioner's sugar sifted over the top as the rosette cookies are. The shells just give you more options and designs to choose from. You can find my recipe for the gluten free batter at the very end of this post, but I really want you to see the talent and the recipes that have inspired the other submitters in our group over the past 52 weeks. In Isabel's own words, "how do you choose just one recipe from 52 weeks of fabulous Sunday Supper Recipes?" While preparing batter, start oil on stovetop. In a pot, add 2 inches of oil. Heat until a temperature of 350 degrees is reached. Do this slowly, if you try to heat the oil too fast then the oil will get too hot . In a small bowl combine dry ingredients and whisk together to combine. In a different small bowl, add wet ingredients and whisk well. Combine the two bowls and whisk until you have a smooth batter. Check oil to see if it is ready. If not, cover batter and let sit until the oil is ready--this is okay to do because it lets the gluten free batter have a chance to "marry" the flours together. When the oil is ready, add the mold with handle and preheat the mold in the oil. You want this to be hot enough so that when you dip the mold into the batter it sizzles and sticks to the mold. Please follow directions on box as to how to cook the rosette or patty shell. I found that I would have to stir the batter every once in a while to reincorporate the ingredients. You will also find that the last bit of batter will be wasted because the oil from dipping the molds in and out is too much to withstand the balance of ingredients. Do not put the batter over the top of the mold--you will not be able to remove the cookie without tearing it. It is better to go half way up the mold with the batter because when the cookie is submerged in the oil it walks up the side of the mold. It is a fast process to fry the cookie--it may take you a few tries to get the rhythm and cookie just right. I use a cookie cooling rack to set my rosettes or patty shells on right out of the frying pan. I then transfer them to paper towels to dust with confectioners sugar. Store in an air tight container, they will be fresh for 2 days. NOTE: I buy my rice powder at H Mart, a national asian food chain across the country. You can make rice flour finer, if the powder cannot be found in your area, by putting a small amount at a time in a blender, vitamix or blendtec and pulsing for a few seconds. Oh, my gosh, Sherron! These are spectacular!!! 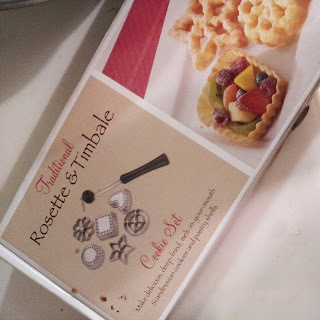 I now need to invest in the timbale molds...very cool. You rocked this recipe...and I'm so impressed you made a gluten free version, too. Happy #SundaySupper! I remember when Liz posted those beautiful lacy things all covered in powdered sugar! I wanted to hang them from the Christmas tree. :) Yours came out so lovely! And I am impressed that you managed to get just as good results with a no gluten batter. Well done! Wow! This is beautiful!! I would so love these!! 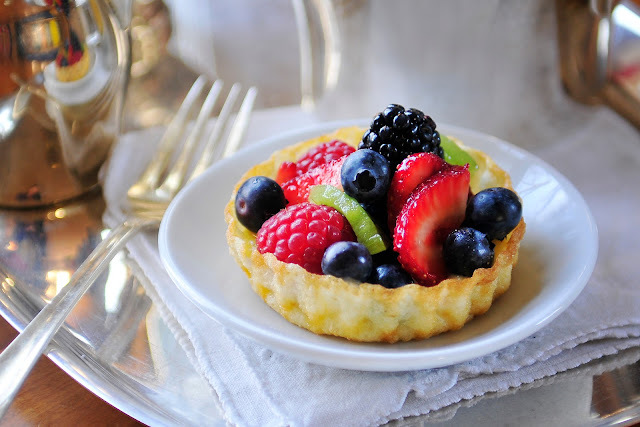 Nothing like fresh fruit in a dessert for me. Love how gorgeous they are, amazing pictures!! So pretty! 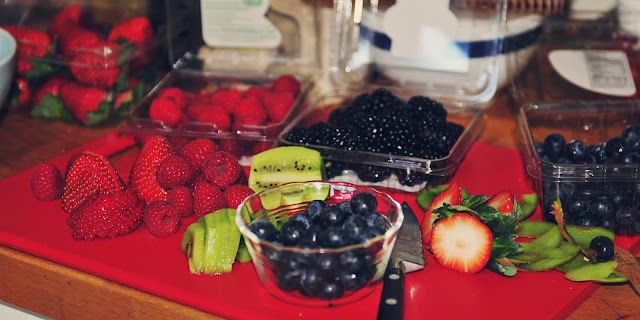 It all looks amazing, love all the fresh fruit with it! These are so lovely. Rosettes are very popular where I live. The addition of fresh fruit just takes this up a notch. These are so gorgeous! Now I need to go purchasing supplies to make them myself! Wow, I´m amazed by your rosettes and timbales! Absolutely gorgeous, both of them! Love those fresh fruits too. Absolutely beautiful! And guess what? I just discovered H Mart this week. Now all I need are those molds and I can get to making these too. It's great to see you participating in Sunday Supper and I can't wait to see what you share with the group in the coming year. They are just gorgeous! 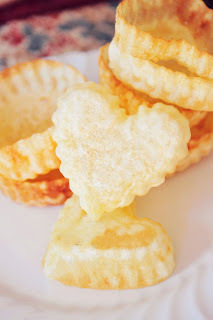 These are on my bucket list...and how wonderful to know that it's possible to make them gluten-free if need be. The little shells are so beautiful filled, too. These are beautiful and all that fruit makes me think that it is such a healthy dessert, lets just pretend it's not sitting on fried dough. Wow, I'm terrified of frying otherwise I'd be all over this! I love collecting new things for my kitchen (which drives the Husband insane cause there's no more space). Molds to make rosettes and timbales would be so much fun! I'm glad you're getting lots of mileage out of yours. Your treats look so beautiful - and I'm all over the brilliant idea of having a fruit station. I echo Lane's comment from above - the fruit makes this healthy, right? These are gorgeous. I love all of that delicious fruit. Yum! Beautiful! What a presentation and I bet it tastes even better then it looks!